Theology matters, but so do love and humility. In fact there is a great sense in which the diversity of theological perspectives presents us with a platform in which to work out love and humility. I confess I have often such arrogance about my own theological convictions that I have been unable to hear the perspectives of others, and unwilling to learn from those with whom I disagreed. Slowly, over time, and with great thanks to many mentors and friends, and with the haunting text of John 17, I came to see that I needed to approach something more like an Evangelical ecumenism. Then, I found John Frame’s book Evangelical Reunion. I have read nearly everything John Frame has written, and yet this book stands above them all as a surprising influential work. Evangelical Reunion softened my heart towards the possibility of an ecclesiastical unity within theological diversity. I had honestly only been toying with the idea in my mind. A few years after I graduated from seminary I found myself on staff at an incredibly diverse church. On our pastoral staff we had pastors from a wide array of backgrounds: Methodist, Church of Christ, Free Will Baptist, Presbyterian, Southern Baptist, and even a former Oneness Pentecostal. We had all come somewhere closer to mere Christianity, apart from strong denominational affiliation. We had also shed some of our more serious errors: baptismal regeneration, oneness doctrines, and perfectionism. But we had also retained many differences. Some were Calvinists and other Arminians. Some were charismatic and some cessationist. Yet, for all these differences and histories we found a way to work together and to serve the larger church. We had many conversations, sometimes intense conversations, but we loved each other. We grew to understanding, and often we found our differences were not as strong as we had thought. Through that ministry I began to toy with the idea that unity among theological diversity might be possible. But I didn’t take it too seriously and certainly had not developed any deep philosophy for the idea. That’s when I found Frame’s book. 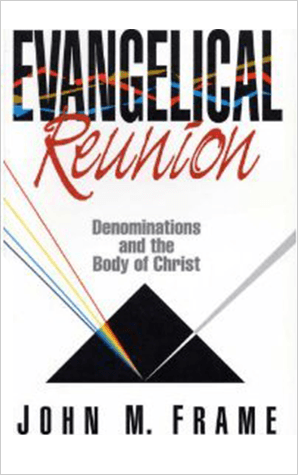 Nearly ten years have passed since Evangelical Reunion was first published. Response to it was hardly overwhelming. A few reviewers seemed a bit bewildered by it and dismissed the main thesis—that denominationism always involves sin on someone’s part—as extreme. Some others liked it, but not well enough to keep the book in print for more than three or four years. I’m told that church courts of some denominations have expected their candidates for the ministry to “set their positions over against:” mine, and my approach has recently been derided by some as a “big tent” view of the church. But it struck a chord with me. I stumbled onto after its days in print were long over and Frame was offering it for free on his personal website. I read the whole monograph as a PDF in two days. I couldn’t stop reading it. I was fascinated by Frame’s claims, his proposals, his logic, and his humility. He proposes that there should really be only “one church.” John 17 is a compelling passage for this argument, for Jesus prayed that we would be one, and that this oneness would testify to the truth of the Son (John 17:20-26). But Frame is not naive. He understands well why denominations exist and why church splits happen. His thesis is simply that denominationalism always involves sin on someone’s part. Sometimes it’s the sin of those leaving, and sometimes it’s the sin of those staying. Sometimes it’s the sin of both, but there’s always sin involved. Our disunity is not honoring to Christ. Of course, the work of biblical ecumenism is the work of re-uniting the Christian church. It has no particular interest in uniting Buddhists, Muslims, or idealist philosophers. So there must be some standards by which we identify people and churches as Christian. Liberal ecumenism thinks that any standards at all violate the ecumenical goal. Evangelical ecumenism must disagree. Frame goes on to describe some potential options for thinking about that standard, and closes out the book in chapter 19 with some recommended tips for advancing the idea in practice. The first step back to unity is to learn to see our denominational differences in perspective. When we look at them from one angle, they seem very important, very imposing, worthy of being maintained forever. But from other angles (angles which, arguably are more in accord with that of the Bible itself) they do not seem to be so great. Looking at our differences from these lenses helps us to see when and where they are not as significant as they might at first seem. The logic becomes compelling as he helps us understand both God’s goals and our own toleration of differences. Frame’s humility, however, is one of the most attractive things about all his theological work. ER represents it uniquely, but it is part of Frame’s character as a theologian and a churchman. Reading this volume softened my heart immensely. It helped me to realize that I can learn much from those with whom I disagree. I can benefit from all that God is teaching them. I can even work together with them to serve the Kingdom of God. I don’t know what a united-yet-theologically-diverse church would look like. The skin and bone of such an idealistic body is not always easy to visualize and describe, yet I am hopeful. John Frame has helped me to believe in the possibility of such a church. It’s the kind of church I want to strive for, and the kind that I believe honors Jesus.